It’s like Harry Potter’s closet but with a happy twist — that’s kind of how Bay Area illustrator Peter Berkowitz describes his 8x3.5x4.5' bedroom in the living room of his friend’s apartment in San Francisco. 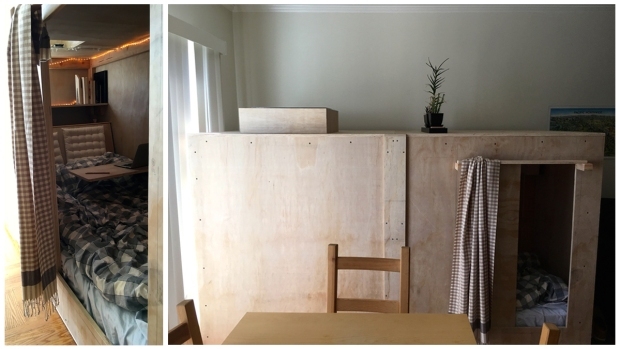 Berkowitz, 25, didn’t always plan to live in a pod, but San Francisco’s ridiculous rents and living costs helped him to make that decision pretty promptly about three weeks back. In a city where one bedroom apartments rent for an average of $3,500 per month and city leaders are grappling to come up with affordable housing solutions (yes, millennials in the city can’t even afford garage-sized rooms), a pod will do just fine for Berkowitz. As Berkowitz puts it, a pod is a really easy way to add on a bedroom. “Having an extra bedroom in a San Francisco apartment raises your rent by a couple of thousand dollars,” he said. Instead, Berkowitz pays $408 a month to live in the pod (plus $108 a month over the course of a year to cover its construction cost) which is in a house by Ocean Beach. “I don’t have any corresponding drop in quality of life,” he said. Right now, Berkowitz spends quite a bit of time inside his pod, using it for sleeping, reading and working. “I’m still working on the soundproofing — I think I’ll line the pod with cork,” he said. It’s easy to see why Berkowitz, whose work has appeared in The New Yorker and De Correspondent, came up with such an unique idea — his creative flair to turn the mundane into something extraordinary is easy to spot in his art. ‘We could have a lemonade stand, sweetie, but wouldn’t you rather do a pop-up ramen shop?” a guy asks his girlfriend in a New Yorker cartoon. He approaches his living conditions in much of the same way he approaches his art: An appreciation for the science of aesthetics. So he went to work in his friend’s garage, and with a little help and about $1,200 worth of construction materials — including plywood from Home Depot — he had his pod. Berkowitz has four other roommates in the three-bedroom apartment. The pod pretty much holds all of Berkowitz’s worldly possessions: a fold-down desk, a slanted and cushioned backboard, and LED lights for reading. In fact, Berkowitz even has room to store his books and clothing in a storage space behind the backboard. “I don’t really own that much so I’m probably an anomaly,” he said. Berkowitz admits that his tiny box isn’t perfect. “If I had to make it again, I would make it taller,” he said. He tries to keep it really clean. “I haven’t had a pod party yet and there are no candles allowed inside,” he said. He adds that the pod isn’t for everyone. “It’s a little small and it’s probably not for people who get claustrophobic. But what I kind of enjoy about it is how absurdly low my rent is."